iLuv has annnounced a new line of cases designed to fit from the iPhone 3G. They range in price from $12.99 to $24.99. The company includes “glare-free” protective film for the touch screen with all cases. iLuv has rolled out new cases for the iPhone 3G including colored silicone ones. The new line includes the iCC71, a silicone case for the iPhone 3G that provides full access to controls and the ability to charge and sync the iPhone while it’s still in its case. It’s available in either black or white and costs $12.99. 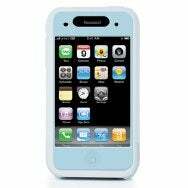 The iCC72 is a $24.99 two-tone silicone case that comes in blue, pink, white or black. It costs $24.99. The iCC73 is made of acrylic and designed to provide protection from scratches and scrapes; it costs $24.99 and comes in either white or black. And the iCC74 is a clear hard case that’s available for $24.99.